What are your thoughts on the Q50/Q60 RedSport cars? I really liked infiniti’s cars because they tended to be cheaper than BMWs or Audis and had similar features and power. I know infiniti’s have worse interiors, and many of their technologies aren’t quite proven, like the disconnecting power steering. But, perhaps being a millennial car person, I like it. 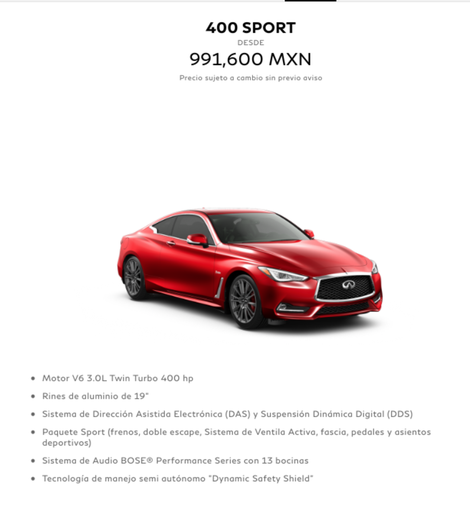 I was just eyeing these cars, I did not expect that these would be priced so expensive, almost 30,000 pesos more expensive than the equivalent “40i” badged bmws (the audi S5 is more expensive though) I get it, they have about 70HP more than the BMWs. But what infiniti needs to understand is that BMW owners don’t cross shop Infintis.